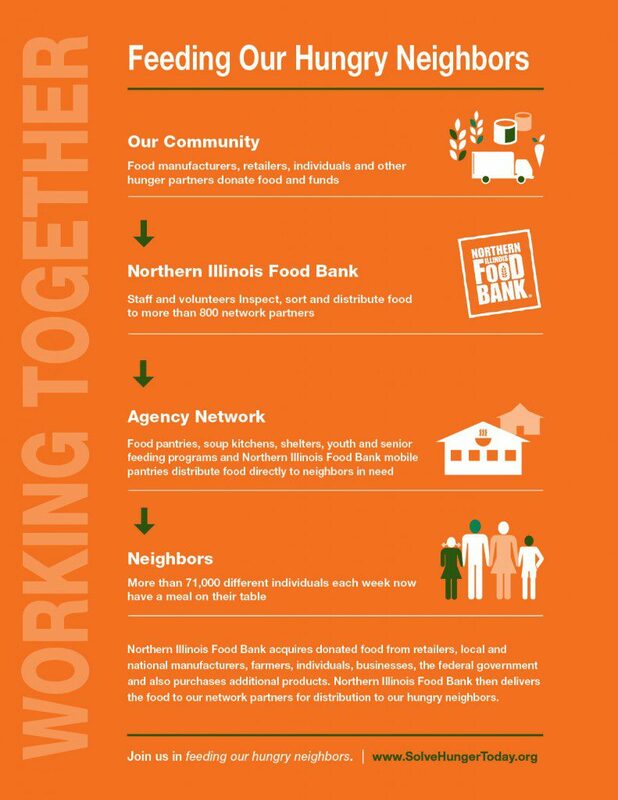 Northern Illinois Food Bank provides food through a network of 800 food pantries, soup kitchens, shelters, youth and senior centers, and has a number of other direct distribution programs to assist hungry neighbors. The Food Bank acquires donated food directly from manufacturers, as well as retail stores through our Food Recovery and Direct Connect programs. Our Child Nutrition Programs, including the federal feeding programs CACFP and SFSP, provide nutritious meals to kids after school and during the summer, and our BackPack Program gives food-filled backpacks for weekend meals. The Food Bank has two Mobile Pantry trucks which act as “traveling food pantries” to distribute perishable and non-perishable food directly to hungry neighbors. To serve our seniors in need we partner with local housing units for our Senior Food Program to provide monthly boxes of non-perishable food selected with the dietary needs of seniors in mind. Northern Illinois Food Bank’s SNAP Outreach Team helps neighbors apply for Supplemental Nutrition Assistance Program (SNAP) benefits, formerly known as Food Stamps. Every holiday season we distribute Holiday Meal Boxes complete with turkey and all the trimmings for a traditional meal. Northern Illinois Food Bank, a member of Feeding America, has received Charity Navigator’s 4-Star rating since 2003 for its fiscal responsibility. Ninety-seven percent of the Food Bank’s resources go to programs that feed the hungry. The Food Bank can stretch every $1 donated into $8 worth of groceries! Read our annual reports for more information on our successes and partnerships serving the northern Illinois community.